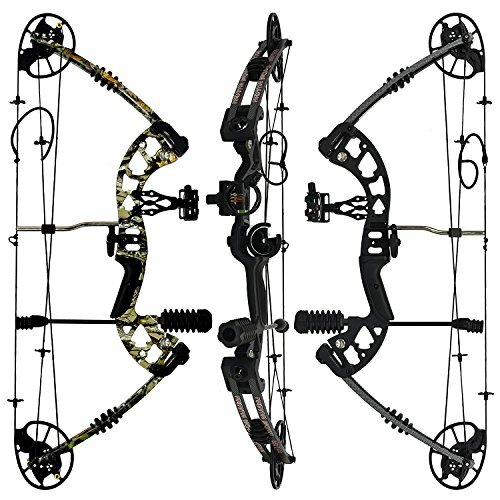 The Southwest Archery Raptor 30-70 Pound Compound Bow Kit is a solid choice for a compound bow. This bow comes ready to use for target practice or for hunting. If you’re looking for a piece of equipment that easily adjusts for any archer, this may be the one for you. It is versatile enough to quickly change draw lengths for any size person. The draw length adjusts from 24.5 inches to 31 inches without the use of a bow press. You will appreciate that the aluminum limbs are made in the U.S.A. with a 30-day guarantee of your satisfaction if anything goes wrong with any part of this compound bow. The Raptor Compound Bow has a capability of flying arrows up to 315 fps. The power behind the Raptor is something you’ll notice right away. Other accessories that are included in the purchase are a lighted sight with 5 pins for reliable accuracy and aiming capability. It also has a level, which is important for the perfect aim. This model will work for bow hunting or bow fishing if you purchase a reel separately. It only comes as a right-handed piece of equipment, which is pretty common. The Raptor has dual cams. These cams have absolutely no plastic parts. From axle to axle, it is 30 inches long. It weighs 3.6 pounds without any add-ons. It also comes with a stabilizer, which helps with balancing and noise reduction. The peep sight and the nocking loop will already be installed when it arrives. With a 75% let-off, you will notice the precise aiming capabilities and distance you will get from Southwest Archery’s Raptor Compound Bow. The Whisker Biscuit is recognized as a must-have by many hunters, because it perfectly aligns the arrow. Also, when shooting an arrow without it, the feathers or fletchings at the end of the arrow will drag and slow the release. It makes for a smooth shot that will make your hunting trip or archery competition a success. Limb is made in the U.S.A. When you are serious about bow hunting, you want the best quality of equipment with the assurance of add-ons that allow precision and reliability, but most of all, results. No one wants to be out on the hunting site or in the middle of an archery competition and have their equipment fail. You will find the Raptor will meet all of those expectations. When you are looking at the cost and value of your compound bow purchase, keep in mind that a stabilizer is a must-have and Southwest Archery’s Raptor already comes with one included. You will have to invest in some bows, but most other accessories are included and they have thought of everything. It also will last longer and not need maintenance and parts as often, which also saves you money. This is because the parts are not plastic, so they are less breakable. Southwest Accessory’s Raptor Compound Bow comes not only in camouflage, but also in plain black for someone who might appreciate the more sleek look. It also has a nice guarantee, and you will likely know within the first month if this is the bow for you. You will be amazed by how versatile this bow is. 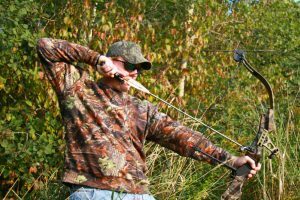 If you are going to be letting others use your bow or you plan to share it with a partner at times, this seems to be the easiest one to adjust for different people of different sizes and strengths. This wastes less time and also saves you from having to purchase multiple compact bows. A compound bow with similar specifications is the SAS Scorpii 55-pound Compound Bow. It is 28 inches from axle to axle, with a draw weight of 30-55 pounds. It has a speed capability of up to 260 fps, which is less than the Raptor. However, it only weighs 3.3 pounds. It does come with some accessories, but not a stabilizer. One advantage of the Scorpii Compound Bow is a 7-year warranty. You will need to purchase the accessories get in order to get the peep sight, nocking loop, wrist strap, and arrow rest. 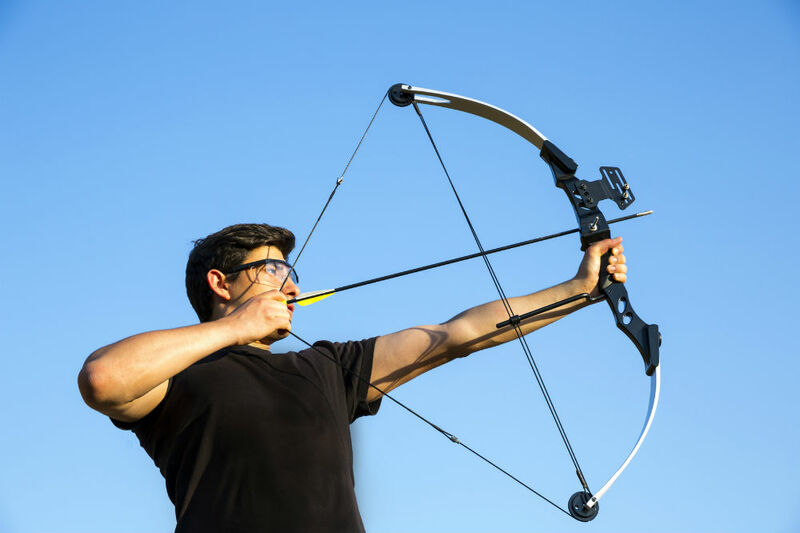 Leader Accessories makes a similar compound bow with a 30-55 draw weight. It comes with dual-cams and some accessories, but not a stabilizer or quiver. However, it does have enough to get the shooter started without purchasing extras right away. It is adaptable for bow fishing and looks sleek and professional as well, with a camo aluminum arm. Like most of these models, the draw length and draw weight are adjustable. It makes for a versatile bow for beginners, but is a solid choice of crossbow for anyone. It seems that the most important add-on is a stabilizer and the Raptor is the only one in this comparison that comes with one. That being said, any one of these could have a decent stabilizer added on. It may just come down to personal preference about appearance and weight. The Raptor weighs a little more, but also may be more durable, since the cams don’t have plastic parts. Out of the three choices I reviewed here, I was at first most tempted to go with the Leader Accessories Compound Bow and then purchase the stabilizer separately. I think it is a solid piece of equipment with plenty of accessories. I like the value of it and the fact that many of the parts are made in America. I do like, however, how the other two provide a warranty. I’m wondering if Leader Accessories would stand by their product as well. I also like that Southwest Accessory’s Raptor’s arm is made in America. It also comes with a stabilizer, along with many accessories, so you’re literally ready to go right out of the box. If you’re someone who likes choices and doesn’t want camouflage, the Southwest Archery Raptor 30-70 Pound Compound Bow Kit is best for you too, because you have the choice to get black.